One of the interesting things about leading chocolate tours is that I get to meet a wide swatch of people who have various interests. Some just like to come and taste, others have more professional aspirations. When Todd Masonis joined me a few years ago, we had some talks about his idea of opening a bean-to-bar hot chocolate salon. I had a pretty good amount of experience meeting with – and tasting – many of the American bean-to-bar chocolates, folks who were participating in what Chloé Doutre-Roussel, whose is one of the most knowledgable people about chocolate that I know, refers to as “The American Chocolate Revolution.” And I was encouraging, but also knew of the difficulties these folks faced in terms of building a facility to make chocolate. Many of these people are mavericks, with the “revolution” starting over a decade ago, and now encompasses perhaps two dozen or so enterprising people who’ve been producing bean-to-bar chocolate in the states. Todd had started a successful internet company so I could tell he had the drive to do something new and interesting, but sourcing the beans and getting the equipment together isn’t easy. 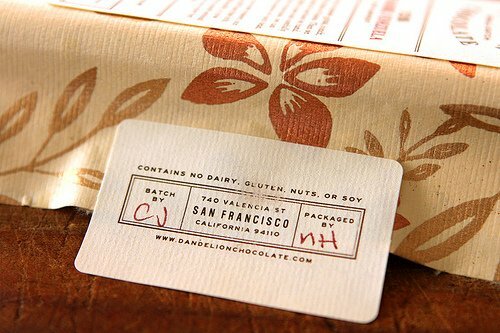 So no one was more surprised than me to get a note in my Inbox recently from Todd, who said that inspired by our talks on that trip, he was about to open his new place, Dandelion Chocolate, producing bean-to-bar chocolate in San Francisco’s Mission district with his business partner, Cameron Ring. And I was intrigued. On my last trip to the states, Todd sent me a few bar of chocolates they had produced now that they were in full production. I kept them for a few weeks because freshly made chocolate doesn’t taste as good as chocolate that’s at least a few weeks old, as it needs time to mellow and allow the flavors to soften and harmonize. Like any fruit, which chocolate is, each cacao bean and tablet has its own story and it’s printed on the wrapper of each bar. Tasting them, I found flavors that I wasn’t used to experiencing in chocolate. The Rio Caribe (Venezuela) was noted to be from their first official batch of chocolate. I found it had a fruitiness typical of chocolate from Venezuela with some sharp tannins behind it. Their tasting notes mentioned “toasted marshmallows” which made me think about it some more and I chewed, and I did catch those dark, brusque notes found in charred marshmallow skins (one of my favorite treats!) but with the sly sweetness that sneaks in afterwards. Perhaps I will save the rest for a batch of makeshift S’mores? Dominican Republic was the last that I tried, made from beans grown by farm started by Swiss immigrants two hundred years ago in the Dominican Republic. 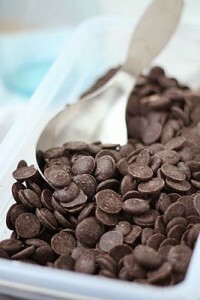 Because they are all high-percentage chocolates (75%) they are more sharp in flavor and robust in flavor. I liked this one the best because it had the roastiest flavor of them all, and I like that taste in chocolate. I was quite surprised at the range of flavors in each bar, which represent the current crop of cacao they’re working with. Chocolate-making is a little bit wild on a small-scale; the big-boys blend beans which have different flavor profiles and roast them to achieve a consistent and standardized flavor profile. But for small chocolate-makers, they have to depend on their sources to provide the right beans, ones that have been properly dried and fermented, and it’s hard to control that process like the big companies can. So folks enjoying these bars should expect variations as well as flavors they’re not accustomed to. But I am always happy to see folks pushing the envelope of chocolate – experimenting with different beans for various plantations, and so forth, because it’s not easy to do what they are doing. And I like when things taste handmade with unexpected nuances. Each table is also signed by the chocolatier and the person who wrapped it up. And yes, they’re making hot chocolate, which was Todd’s original dream. I’m looking forward to seeing what Dandelion Chocolate produces in the future, and on my next visit to San Francisco, I plan to stop by for a warm cup of hot chocolate. And I’ll raise it to toast Todd on his success – perhaps with a homemade S’more chaser. I much prefer nutty, roasty chocolate as well. Fruity chocolate is not my favorite but my LOVE for artisan bean to bar chocolate far outweighs that! It has so much more soul than large scale producers and I feel that as a flavor, if that makes sense. We found these at a local artisanal cheese shop in Sarasota, Florida. They are absolutely wonderful and some of the best chocolate I’ve ever had. The best part is that a small piece can satisfy the chocolate craving. I can’t wait to see what they do with hot chocolate. 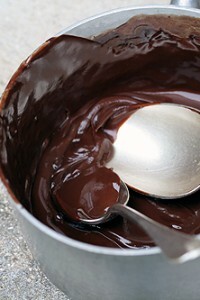 The list of suggested links at the bottom of the blog post includes Taza, my hometown chocolate. (Yeah Somerville!!) The place to go for hot chocolate though is LL Burdicks. There is one in Harvard Sq and one in the Back Bay in Boston. They always have milk and dark chocolate hot chocolate, but they also have single country hot chocolate. If you find yourself there in the summer, they will make you an iced chocolate, which is arguably better for the really complex chocolates and the more acidic ones. You should put it on your list, or email me and I will drop some in the mail to you. My goodness, the way you describe this chocolate is like foreplay! I think I need a cigarette. But truly, reading your descriptions of the various chocolates, I can almost taste them. 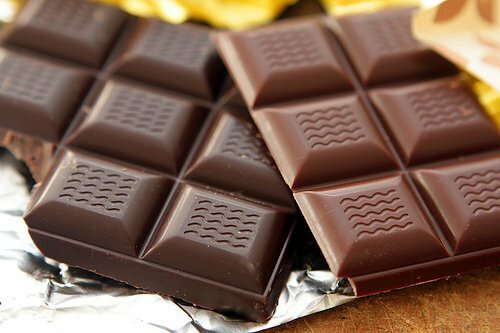 A truly good chocolate will have blended flavors and delicate hints of tastes. As a girl who grew up on Hershey, hand-crafted chocolate is something I’ve just discovered in recent years. I was pleased to find a home-grown company right here in Texas on a business trip from Austin to Houston. Tejas Chocolate, made in Spring (near Houston). As far as I can tell it’s only sold in Cafe Luz in downtown Houston, but can also be bought online. If you ever return to Central Market (please, please!) you should try some. I cannot miss a day of reading your blog. You educate as you entertain and I’ve gotten some pretty good tips from readers’ comments too. The new space is amazing and worth a visit. I now have one more reason to make a trip to San Francisco….and soon! Gosh. I wish these were down the road from me rather than halfway across the country. They look and sound amazing. Oh my bleeding heart – these look heavenly (love the detail and colour in the shots). Quality bean to bar chocolate is difficult to come by where I live – only a few outlets stock the stuff and mostly big names – none of these small batch manufacturers. Perhaps this is a desperate cry for help to any manufacturer reading this. SOS! Thank you for the informative as well as interesting post! I clicked on the link for the Dandelion website and there is a great video showing the steps of the bean to bar process. Fascinating! I think I’m about to order some for myself! I’ll have to look at the Texas company mentioned in a comment as I live in Texas – thanks Claire! Hi, I was just in there yesterday actually and the adorable cashier was telling me about how you’re a fan of their chocolate. What perfect timing to read the proof of his claims the next day! And yes, I concur, the bars are DELICIOUS! I just got my first order of Dandelion Chocolates! So glad I splurged for the 3-bar set so I could compare tastes. It’s amazing when you taste them side-by-side how much difference you can sense. When I took my first bite of one, I thought ok, this is good but it tastes like dark chocolate. Then you taste the other two and realize they are all sooo different. And so amazingly good. Ever since I did a tasting at Alegio (http://www.alegio.com) in Berkeley’s Gourmet Ghetto, I’ve been spoiled when it comes to chocolate. It was there that I first tasted chocolate by Claudio Corallo. 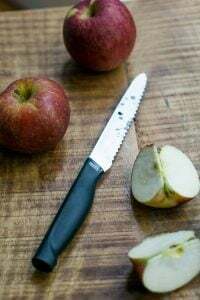 He removes the germ and does NOT add vanilla or soy lecithin. At the end of the tasting, we did a blind tasting which included Scharffen Berger’s bittersweet bar (also started in the SF Bay area before they were sold to Hershey’s) and it tasted like a vanilla-flavored chocolate on my newly reset taste buds. I now walk past most local chocolate shops because I prefer to snack on the Claudio Corallo bars I keep at home (I like their 80% sable bar). They’re not cheap, but so pure that a little goes a long way. I walked by Dandelion in the Mission back when it was still under construction and it seemed like they’d be the type of place that’d also leave out the additives (their website confirms this). Their packaging is also significantly nicer than the Claudio Corallo bars – much better for gifting. (Apparently Claudio Corallo, who seems to be head down in his chocolate making…to the point that he live in São Tomé and Príncipe at the plantation site…isn’t much into marketing which is why high-end places like Harrod’s stopped carrying his chocolates.) Can’t wait to check out Dandelion’s chocolates! Dandelion makes my favorite chocolates to date. The one thing you didn’t mention but really stands out to my mind is the creaminess they have managed to create. The chocolate enrobes your palette and has a fat mouth feel reminiscent of a milkier chocolate and so is satisfying in that way. I was in Spain recently and found taza chocolate. Amazing. keep thinking whether small-produce chocolate makers can beat superb swiss and belgian mass-producing companies by the taste? I loved reading about this company and their love of labor they put into producing these chocolates. I just ordered their gift set of 3 bars. Can’t wait to taste them. They are doing amazing stuff. I got the 3 bar set at Eat Real last Fall and enjoyed the journey with each one immensely (so much so that I continue to buy bars to keep all 3 stocked in my chocolate drawer). I also have to mention how pretty the paper is they are using too. I save it for art projects and letters after finishing each bar. And I concur with the other commenters that have mentioned it—The new space is indeed superb! Unfortunately I’m on a no-chocolate, no-sugar diet right now due to migraines, but I discovered Dandelion while wandering in the Mission a few weeks before I started the diet (I live 1.5 miles away). I loved everything except for the limited edition bar they had (whose origin I can’t recall), which I can only describe as… shrill. Sort of overly fruity and slightly burnt. It was also the only one that wasn’t available for tastes, so lesson learned. Angelenos may be interested to know that I saw this chocolate at, of all places, Steven Alan on Abbot Kinney (a clothier)! Sounds lovely! 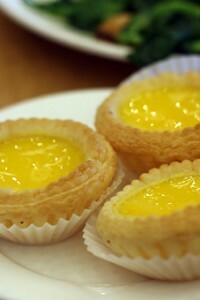 Will definitely add it to the list when we make our visit to family in SF! Trader Joe’s sells a little stack of chocolate bars from different countries and i never realized all the variations till I tried them. I can only imagine how incredible the artisan chocolate must be. 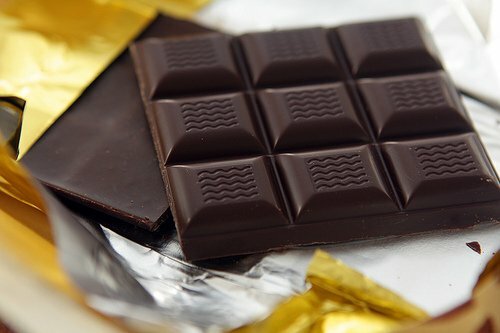 There is a chocolate made by a company called Chocovic (Spanish) that made excellent chocolate. I tried to go to visit them when I wrote my chocolate book but they were like a closed vault. However their Ocumare chocolate is really good and Trader Joe’s used to carry it; if you see a bar there, give it a try. Have you seen Willie’s Wonky Chocolate Factory? It’s a fantastic fly-on-the-wall documentary about a guy who started a tiny chocolate factory in the UK using beans from his cocoa bean farm in Venezuela. He now does Masagascan, Indonesian and Peruvian varieties. Tasting the differences between them is fascinating, and yes, the Venezuelan ones are fruity! I have no affiliation with him, but I love his chocolate! When you ran the post about food gifts to bring French people, I immediately noticed the bar of Dandelion chocolate. Maybe it’s because I’m an interior designer, but their packaging struck me as chic and so well done, that I went straight to their website to read about what was inside the beautiful wrapper. What a wonderful story! I so appreciate people who work hard to achieve the best results possible in whatever they create. I plan to order some Dandelion chocolate this week and will look forward to trying it and sharing with friends. The niche-ness of bean-to-bar in the US makes me feel superlucky, as in New Zealand our major chocolate brand, Whittakers, is bean-to-bar. And it’s wonderful, especially their Dark Ghana (72%). I love trying the artisanal stuff when I’m in the US to experience all the different tastes, but it’s fantastic that we have such a high quality product for our everyday chocolate. very cool! i have been living on amano for some time. i will have to give these guys a try though, i’m not too far away from them. Love when you talk about bean-to-bar, because I’m finding that these days I can’t love curated chocolate enough — it’s an affordable miracle! Thanks for ongoing guidance. BTW, totally down with you wearing your “too-too” whenever, whereever, but especially on the topic of chocolate! Looks absolutely delicious! I would love to try some. We don’t have that brand of chocolate in Australia but hopefully we will get it soon. Thanks for the background stuff on chocolate making big vs little – I’ll appreciate the nuances better from now on. Good tasting notes too. When I was in Spain this fall I visited the chocolate museum and had a little hot chocolate drink in a demitasse cup. The chocolate was really thick and had the consistency of a melted chocolate bar. I wish I had gotten the name if it. My SIL said it wasn’t chocolate chaud, but I wonder if it was. Sissy, there are several chocolate museums in Spain so I don’t know which one you’ve been to, but a well-known brand here is Valor (I use their cocoa and bars for baking). Maria I was at the chocolate museum in Barcelona close to the Picasso museum. I am interested in how they made the hot chocolate drink I had there. It was very thick and had the consistency almost of a melted chocolate bar. I thought it was chocolate chaud but my SIL said it wasn’t. Most hot chocolate recipes in Spain call for some cornstarch (about 30g per liter) to get that thick consistency. They even sell some chocolate bars with cornstarch added to make hot chocolate, but it’s always better to make your own. As Maria said “chocolate a la taza” in Spain has corn starch (as she said, 30g per liter) but, since adding and dissolving starch is not that practical, you can buy “chocolate a la taza bars” in any supermarket. This chocolate is melted with boiling milk and you get thick chocolate. The chocolate they use in this bars is not that great so, if you want a really good “chocolate a la taza”, you will have to do it yourself (once more, as Maria said). Here you can find a recipe by Ramon Morató, who I think is the best chocolate pâtissier in Spain. MOP: Dissolve the starch in 100g cold milk. Boil the milk and the cream with vanilla and salt. Infuse the mix for a few minutes. Thick it with the mix of starch and milk. Add to the chopped chocolate and emulsified it. I’ll be in San Francisco next month and head right for the Mission and Dandelion Chocolate. It sounds great. I didn’t know chocolate is better if you let it age a few weeks–it never lasts that long in my house. I’ll make the attempt. I stopped to visit Dandelion’s newly opened cafe yesterday and tried one of their hot chocolate offerings, the Mexican. 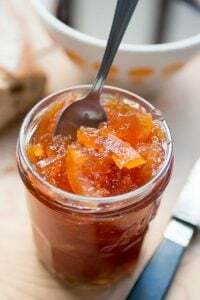 It was flavored with a bit of almond, cinnamon, and chile and was fabulous. So was the little chocolate caramel tart with seven perfect flakes of fleur de sel. The chocolate looks amazing – I need some now! I’m sure there isn’t any where I live! I was looking forward to going there on Tuesday after a Bakers Dozen meeting. I was so excited to try their cocoa pulp smoothy I practically danced down Valencia. Got there only to find they are closed on Tuesday… Wah wah wah… Headed into Craftsman and Wolves instead. I’ll be there today though and can’t wait! So excited to see your post David! Dandelion for Valentines gifts (smart timing, David!) – and the turnaround service was fabulous! We can’t comment on the chocolates yet, because they’re [surprise?] gifts for this Thursday. But you definitely found the express route to our hearts, and we were so pleased to find that great minds really do think alike! Merci! I ordered the three pack myself!! Just had to try another bean to bar chocolate. Finally have a place to go that has a variety of these wonderful offerings. Now if it were not surrounded by full parking places and heavy traffic!! How amazing – I can’t believe you know the owner of Dandelion Chocolate! It is by far the best chocolate that I have encountered here in San Francisco! The moment I first tasted the Venezuela bar, I swooned. I found the bars at Rainbow Grocery in SF, a place that is great at supporting local small businesses, but have yet to check out the eatery location. That will be next on my list! To chocolate! I have to second chocolate lover’s comment about Alegio. I had the great opportunity of working at Alegio in Berkeley’s Gourmet Ghetto for a brief stint, and also have been converted to Claudio Corallo’s following. The owners are extremely passionate about educating chocolate lovers and bringing some of the most amazing chocolates from around the world to the Bay Area. If you make a stop at Dandelion, (which I keep meaning to try myself) I hope that you have the chance to visit Alegio as well. Who could ever have too much chocolate? Thank you for this, David. I immediately purchased the 3 pack for my husband for Valentine’s Day last week. The shipping to Chicago was reasonable and quick, the packaging pretty and, best of all, he adores them. Multiple side by side tastings later, he has decided upon a winner (for him) but what he really wants is just more, more, more of the same. 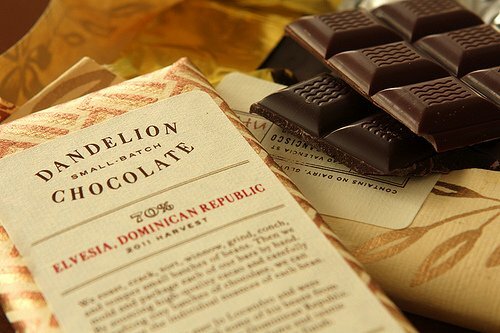 Dandelion Chocolate is definitely a favourite of mine, although I prefer the Madagascar bar to the other two. I’m looking forward to visiting their shop later this year. My sister-in-law was in San Fran last week and brought me a three pack. So far I have tasted only one, and oh my. Love it. Strangely, she did not like it, used to Hersheys! But I love it. Super yum. My friend Jane bought a three pack with the same flavors you tried here after reading this post. We had a delicious tasting today. I liked the Madagascar best, I like a fruity chocolate. But really all three were really very good. Thanks for telling her about this chocolate.